UltraCleanse® antiseptic hand sprays are your first line of defense against 99.99% of germs and bacteria that cause illness. The water-free patented unique liquid spray formulation contains 75% Isopropyl alcohol blended with skin moisturizers that leave no tactile residue and improves Glove donning. According to the Association for Professionals in Infection Control and Epidemiology (APIC) Guidelines for Infection Control Practice, "Alcohols applied to the skin are among the safest known antiseptics." UltraCleanse® contains a hand-protecting emollient that will not dry your skin with repeated use. UltraCleanse® was created by health care professionals. Used in hospitals, nursing homes, food service, hospitality and any individual seeking effective germicidal protection against viruses and Influenza. Meets CDC guidelines for hand hygiene in Health care. 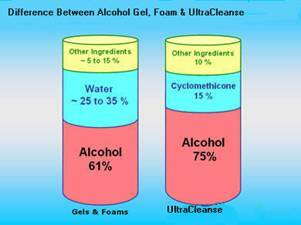 UltraCleanse® does not rely on thickeners and provides superior performance over gels and foams. A 2-ounce bottle of UltraCleanse® is very economical and provides up to 40 applications. Available in 2 oz. 4 oz. and 8 ounce spray bottles. Made in the U.S.A.